In the century after Roman chant was brought to the Frankish kingdom, the liturgy was embellished in a number of ways. Sequences and hymns were created, many settings of the Ordinary of the Mass were composed, and tropes were added to both Ordinary and Proper parts of the Mass. Still another embellishment was organum, the addition of a second melodic line to a chant. This was feasible only for the solo chants, mainly the Gradual of the Mass and the equivalent Responsory of the Office, as well as the Alleluia of the Mass and the concluding (Benedicamus Domino) Deo gratias of the Office. It is helpful to see all of these additions to the liturgy as stemming from a Frankish mentality (the Franks were a Teutonic people). 11th Century Psalter, Gothic staff notation. From the John Rylands Library. Click on image for larger view. At first, organum was parallel to the base chant at the interval of a fourth or a fifth. This was certainly improvised at first because the surviving treatises explain how to do it. Soon the organal voice extended many notes for each note of the chant. A later development was discant, which provided only note-for-note correspondence of the two voices but the upper voice could move against the direction of the chant instead of only parallel to it. 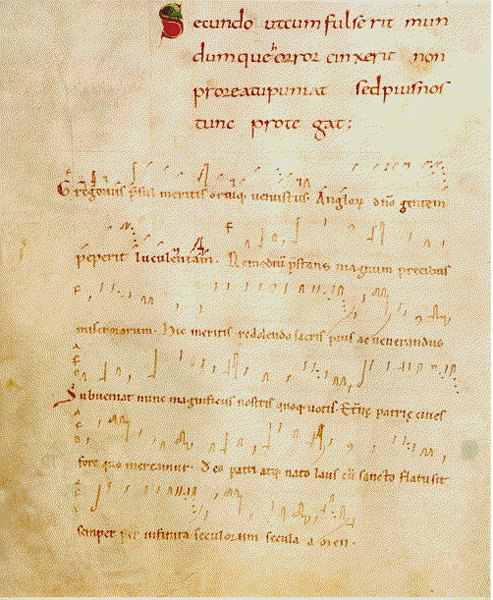 Recorded examples of early notated polyphony from Winchester and Chartres are few. 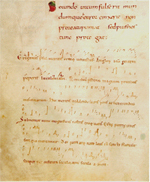 In the middle of the twelfth century, a significant amount of liturgical polyphony was notated in four manuscripts collected at the monastery of St. Martial in Limoges. This music is known as Aquitanian polyphony. 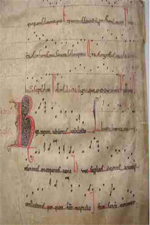 Another manuscript of similar French origin belongs to the shrine at Compostela in Spain, containing music for the feast of its patron St. James. The last source even has an example of polyphony for three voices. 12th – 13th Century Sequentiary, Spain. From Columbia University. Click on image for larger view. Soon after, the construction of the new cathedral of Notre Dame in Paris from about 1163 was the occasion for the creation of a repertoire of polyphony for the Mass and Office of major feasts, at first in two voices but also in three voices (organa tripla). At the end of the century, two Graduals for St. Stephen (Dec. 26) and Circumcision (Jan. 1) were composed for four voices (organa quadrupla). We have no idea how many musicians at Notre Dame had a hand in this creativity, but there must have been more than the two who were identified a century later as the best of them. (How could they be the best if they were the only ones?) Leoninus came earlier, followed by Perotinus, but we know nothing of their dates. The two quadrupla (dated to events of 1198 and 1199) and five other pieces are attributed to Perotinus at this later time, but otherwise the identity of the composer of any other Notre Dame organum is pure speculation. (The names Léonin and Pérotin are modern French translations of the Latin names, which were the only forms written at the time.) This repertoire was collected in a “large book of organum,” according to the same later source, but the three major manuscripts that survive from later in the thirteenth century are probably later compilations. In the thirteenth century the principle form of composition was the motet, a work in two, three or four voices. The lowest voice was a chant tenor, and each of the upper voices had a different text, either Latin or French. These were not liturgical compositions, a confused notion caused by the later use of “motet” to identify a free composition of sacred music. Their composers, all anonymous, were trained in the cathedral and collegiate choirs, but not all of them found lifelong occupation there. On their own, they used the musical materials and techniques most familiar to them to compose these secular works. By the early fourteenth century, around 1320, all of these forms were identified by the term “Ars Antiqua” (old art) because the “Ars Nova” (new art) was beginning to develop. Outstanding in this development were Philippe de Vitry, whose surviving motets are few, and Guillaume de Machaut, a poet as well as composer who collected his extensive works (over 140) into carefully arranged manuscripts that still survive. Apart from his Messe de Notre Dame and a few Latin motets, all of his music is secular.